Seán Burke was a member of No. Section 1, Active Service Unit, Dublin Brigade in 1921. I will cover his involvement in the abortive Drumcondra ambush on 21 January 1921 and also his experience at the burning of the Custom House later, in May. He walked away unscathed from both encounters together with his friend Mick Dunne. 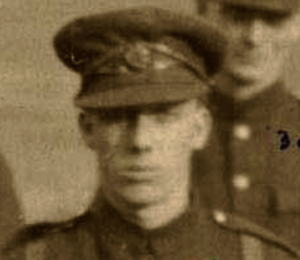 Burke was originally with the 1st Battalion but had transferred to the 5th (Engineers) Battalion on its formation along with many other volunteers who had specialist skills. When the ASU was set up towards the end of 1920, it drew a disproportionate number of men from the Engineers; and in fact Seán Burke, Mick Dunne and Thomas Bryan were all transferred together from there to ASU Section No. 1. Both Nos. 1 and 2 ASU Sections operated mainly on the north side of the city and were under the command of First Lieutenant Frank Flood (brother of Tom, captured at the Burning). In their first engagement with the enemy, both sections operated together in an attack on two Auxiliary lorries on Bachelors Walk in the afternoon of 12 January 1921. There were no casualties on either side despite a hail of rifle and handgun fire and two grenades exploding. Just over a week later on the morning of Friday 21 January, a unit of nine men of ASU No. 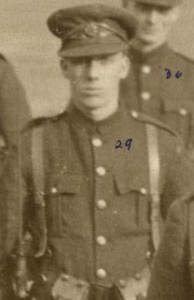 1 Section under Lt. Frank Flood (19) was detailed to ambush a Black & Tan lorry regularly travelling from Gormanston, at Binn’s Bridge in Drumcondra. However, after waiting some time with no sign of their target, Flood moved the unit to a new position just north of the bridge over the Tolka in Drumcondra at Clonturk Park. Their presence was reported to Dublin Castle, they were enveloped by units of Auxiliaries and one ASU man was killed and five others captured. There were no casualties on the British side. The dead IRA man was Michael Magee, a veteran of the 1916 Four Courts garrison. The five captured were Frank Flood, Patrick Doyle (a brother of Seán Doyle who died from wounds after the Custom House attack), Thomas Bryan, Bernard Ryan and Dermot O’Sullivan. 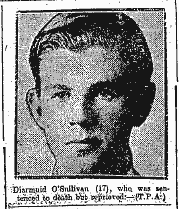 The seventeen year old O’Sullivan was spared the noose because of his youth. His four comrades captured were among six IRA volunteers hanged in Mountjoy Jail on 14 March 1921. The other three men from the Drumcondra disaster – Seán Burke, Mick Dunne and Christopher ‘Kit’ O’Malley – managed to escape from the scene and lived to fight again. The story of Seán Burke’s escape is extraordinary and is recounted in detail by Harry Colley, Adjutant, Dublin Brigade (from page 63 in BMH WS1687). Having unsuccessfully tried to assist the mortally wounded Michael Magee, Burke entered a nearby house which was occupied only by an elderly man and a young maid. He hid his revolver in the fireplace, donned the old man’s spectacles and told them to pretend that he was his son. The Auxiliaries were in hot pursuit; they soon entered the house and subjected the three of them to rigorous questioning. Seán’s assertion that he lived there was supported by the maid – the old man was shocked into speechlessness – and the somewhat dubious Auxiliaries eventually withdrew. Burke arranged for the maid to meet him later with his revolver and he departed through the front door to safety. His charmed existence continued because, again according to Colley, Burke took over as Brigade orderly after the Drumcondra affair and he had some incredible escapes from capture while carrying despatches – being held up and thoroughly searched several times. Yet he always succeeded in getting away with the despatches intact. If further proof was needed that Burke had an astonishing ability to talk his way out of trouble, it came on 25 May 1921 in the attack on the Custom House. ASU No. 1 Section had been reorganised after the Drumcondra disaster and Frank Flood’s brother Tom was now in charge; Mick Dunne was Section Leader; and Seán Burke still an active member. During the numerous arrests which followed the surrounding of the Custom House by British forces, Burke and Dunne were among those held up by the Auxiliaries. Amazingly they once again talked themselves out of the situation and were among the few IRA men who escaped completely from the scene that day. After the Custom House deaths and arrests, the remnants of the ASU and the Squad were amalgamated into a new unit called The Guard and most of this unit, including Burke and Dunne, joined the newly formed National Army’s Dublin Guards Battalion after the Treaty. Both men can be seen in the iconic photo taken on 4 February 1922 at Beggars Bush Barracks. That was three days after 46 members of the Dublin Guard had marched past City Hall, taking the salute from a beaming Michael Collins, to occupy the first barracks vacated by Crown forces. Mick Dunne’s good luck ran out when he was killed in a Civil War mine explosion at Knocknagoshel, Co. Kerry on 6 March 1923; while it appears Burke was one of those who left the National Army before that conflict started. He certainly does not appear in the Army Census taken in November 1922. I am appealing to Readers of this article who may have information about Seán Burke to please contribute. There is a lack of information about his earlier career and his subsequent fate after the Civil War. I have put together some information gleaned mainly from Witness Statements but strangely, Seán Burke does not appear in either the online Pensions or Medals Files in the Military Archives. I believe he was originally from Co Clare and may have been staying in digs on the South Circular Road area in 1921. He joined Na Fianna prior to the 1916 Rising and subsequent to that the 1st Battalion of the Dublin Brigade, Irish Volunteers. He emigrated to the USA sometime during or after the Civil War and was back in Dublin at a meeting of old comrades to discuss pensions in the 1930’s. Seán is somewhat of an enigma I would love to learn more about. A word of caution though. He was not the only man of the same name in the Dublin Brigade around that time. Another Seán Burke, definitely a different person, fought as a member of the anti-Treaty Four Courts garrison in the Civil War. Our guest writer was a leading campaigner for the recent naming of the bridge over the River Tolka in Drumcondra for Frank Flood, to commemorate the tragic events referred above.